Goblin is a general term to describe the intelligent non-mana-bearing beings in the world of Drowtales. They are often seen as animals and less than garbage by elves due to their many detriments, such as the inability to see and use mana and less than average intelligence. However, some major clans employ the service of goblins either as servants/slaves or to power their armies. Goblins are also seen as a food source for elves, although this kind of fare is seen as "commoner food" to noble societies. 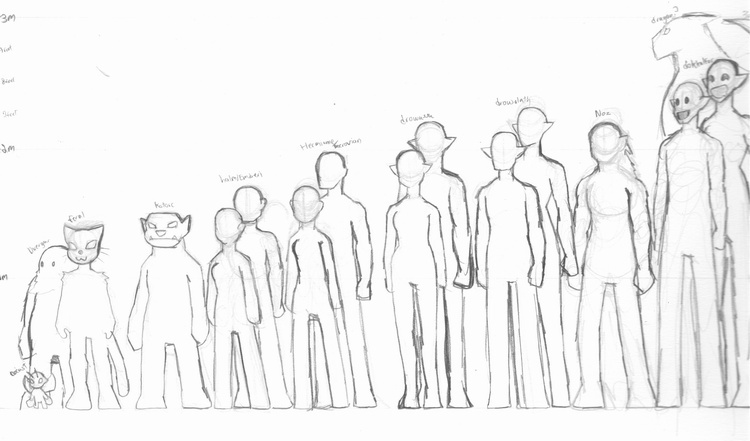 Goblins come in different sizes and varieties, ranging from the tiny Kotorcs to the giant Noz. Goblins are often used as front line shock troops by a few clans--they are valuable assets for their resistance to mana (although they can still be harmed by attacks such as mana blasts), and the tasks goblins can accomplish a drow cannot. Breeding goblins to be troops is a highly profitable investment for clans at war, for goblins grow to maturity and multiply much faster than drow soldiers. Notable clans that employ the service of goblins large scale are the Val'Sarghress (who call goblin soldiers 'War Meat') and the Val'Nal'sarkoth, who employ the services of goblins that comprise the majority of their forces. The Nal'sarkoth clan in particular allows goblins to obtain seats of power within their clan by forming sub-houses of their own. To the Nal'sarkoth, forging these kinds of alliances guarantees the goblins' trust. Halmes make up the majority of goblin races and are a major power on the surface with the absence of elves. Halme kingdoms such as Haltonreibe and Nagyescsed have established power over the land, though relations with elven neighbors vary between kingdoms. Haltonreibe, for instance, is familiar with the drow that often come to visit their city; by contrast, Nagyescsed is hostile towards all elves and often clash with both dark elves and the vanir of Vanaheimr. Many halme villages dot the landscape and the rate at which they tend to sprout up is like mushrooms to a drow. They are often the target of Sarghress Highland Raiders, or they go to trade with Goblin-friendly mercantile clans such as the Val'Illhar'dro and Nal'sarkoth. A notable Halme is Kai that works under the service of a trader named Dhal, the owner of the Stone Company. Rift halmes are the pale, blind relatives of surface-born halmes, having devolved into this state because of the underworld environment. Rift halmes have been known to dwell in the sewers of Chel'el'Sussoloth, feeding off of the refuse the drow throw away. Rift halmes are almost exclusively used as slaves or for food--one notable Rift halme is Nainai, a nanny and servant for Kharla'ggen Vel'Vloz'ress. Rift halmes are of the same height and build as halmes. Known to the drow as hairy beastmen, these muscular, red haired goblins came from beyond the sea to pillage and destroy everything in their path. The halme kingdoms have been at war with the Hermionne invaders for centuries, and the beastmen are winning. Hermionne also plague various drow colonies and territories, giving the drow a certain fear of them. Hermionne on average are the second largest of the goblin races. These warlike goblins are highly versed in the art of surface warfare, and have the knowledge to combat even the Drow themselves--raiding parties are known to hit colonies with horseback troops and destructive siege weapons. Hermionne are not above infiltrating settlements to commit arson and murder. Toland was a force commander who led an entire army against the colony Machike'Shikumo. The Hermionne kingdom is called Niwaecer, and is the source of the hermionne's quest to purge halme settlements that work with drow, fueled by religious fanaticism and the belief that halme areas in or near the Mist bear evil omens and harbor black devils. Their nation is only 200 years old, yet it has spread like wildfire across the halme city-states, conquering each until only Haltonreibe remained. Found on the islands of Nuwa, emberi have a distinct culture different from their halme cousins and their lives are tied to the sea. Their hair and skin are darker than halmes and hermionne, and their bodies are usually of a smaller build. Vaelia is a notable emberi in the service of the Sarghress clan, and Agneya'mukhi Balvhakara is often seen with two emeberi children attending her. Those freed from slavery in Chel'el'Sussoloth have gathered in the outskirts of Machike'Shikumo to carve out a new life under the Sarghress banner. Kotorcs are the smallest of the goblin races, often used as guards and slaves. They have dark green skin and a snout-like face, but these goblins have the ability to speak and comprehend languages. Kotorcs are known to gather many wives and possessions as a form of riches. Noz are the tallest goblins known, and are quite vicious and tribal in their natural habitat. Their appearance is feline-like as they sport long, furry ears and full body fur with spots on the arms, legs and face. Noz also have long manes that stretch from the top of the head to the base of the spine. Shoki Vloz'ress has a pet female Noz. This page was last modified on 12 June 2017, at 11:32.